Easy to use, chlorine free fresh water tank and system cleaner. Keeping your drinking water tanks and containers clean and safe has never been easier, or so effective. Elsan Fresh Water Tank Clean de-scales and eliminates algae and bacteria from drinking water tanks, water systems and storage containers. Regular usage helps keep your water system free from micro-organisms and black spot, it also removes calcium build up and other deposits to provide fresh drinking water in your boat or caravan. Simply add 100ml of Elsan Fresh Water Tank Clean for every 20 litres of capacity. Fill the tank with water and allow to soak overnight. Empty the water tank and rinse the system thoroughly until any loose deposits have been flushed through. 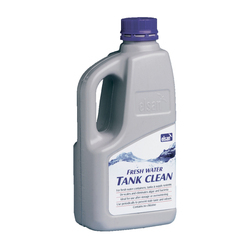 Elsan Tank Clean contains no chlorine so it has none of the associated smell or risk.